In a northern city like Edmonton, it’s somewhat surprising that we don’t celebrate the inevitable darkness of winter more. 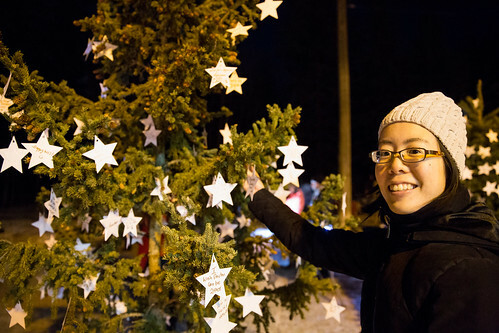 It could be as simple as highlighting Elk Island Park, a dark sky preserve perfect for star gazing, or taking advantage of the opportunity to light up the night, outside of the holiday season. 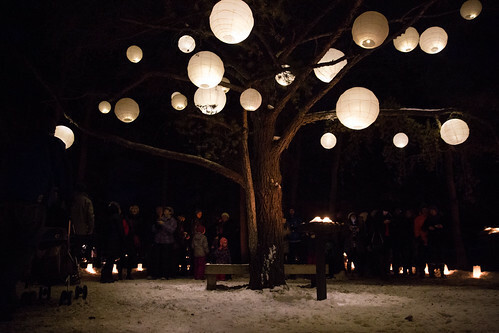 This weekend’s Flying Canoe Volant is a great example of this, lighting up the trails of the Mill Creek Ravine to encourage families to explore an area typically avoided after dark. 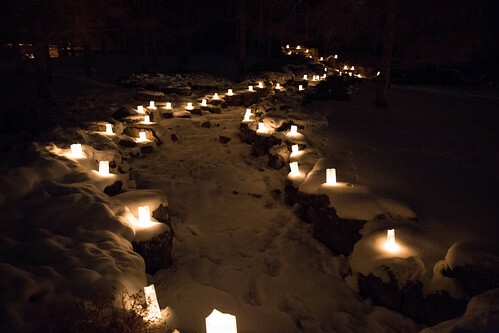 And every December, the Devonian Botanical Garden’s Luminaria transforms the Kurimoto Japanese Garden into a beautiful canvas of lights. 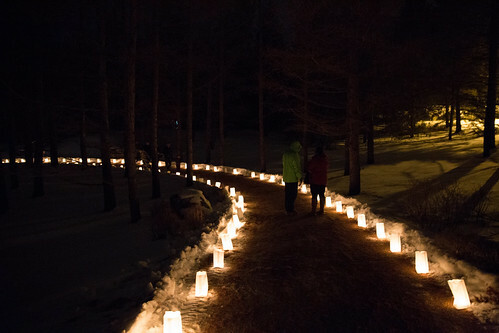 Mack and I had been meaning to visit Luminaria for years, but never planned well enough in advance to do so. Tickets are sold fast and furious weeks prior to the annual festival, held the first weekend in December. In 2015, organizers added another layer to the tickets, asking patrons to choose between limited on-site parking and free shuttles from either the University of Alberta or Devon in advance. Mack and I found the shuttle option both convenient and seamless – we hopped on the LRT from home and walked over to the waiting yellow buses parked across from Health Sciences/Jubilee Station, and allowed the able drivers to take care of the rest. 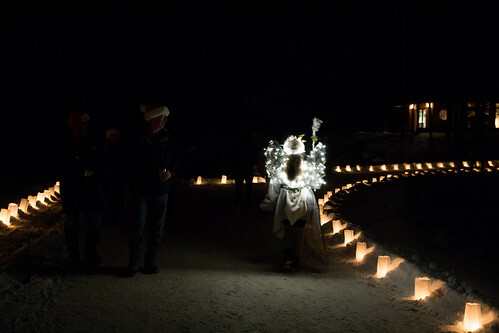 It was clear that for some, Luminaria is an annual family tradition that helps mark the beginning of the holiday season. Patrons varied in age, with some groups spanning multiple generations. The main attraction is, of course, the Kurimoto Japanese Garden, its paths lined with 2,000 candles. 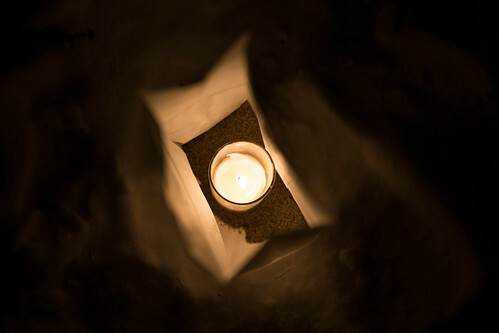 Each night, volunteers light the candles, all carefully placed into paper bags weighted down with sand. To recreate this magic at home, the gift shop even had ready-made kits for sale. Just to the right of the garden was a section called Memory Lane, meant for those wishing to light a candle in remembrance of a loved one. Volunteers reminded us to be mindful of those in mourning along the path. The rest of our stroll was a mix of quiet reflection and appreciation of the lights in a context of darkness, and a reminder that the festive season was around the corner. A highlight for me was enjoying the complimentary hot apple cider while listening to roving Christmas carollers. Besides the main attraction, there was a small hay bale maze for the young ones to explore, and those of all ages had the option of writing down a wish to hang on their trees (reminding me of the Nuit Blanche Wishing Tree installation in Churchill Square last fall). There was also a small indoor craft sale to peruse for those thinking ahead. Our only complaint was with the food offered on-site, as the choice was limited to beef stew. Perhaps other options could be offered in the future that would be equally easy to eat and venue-appropriate? A broader menu would at least encourage patrons to linger, as we found we were done exploring the garden and the surrounding attractions in about an hour. 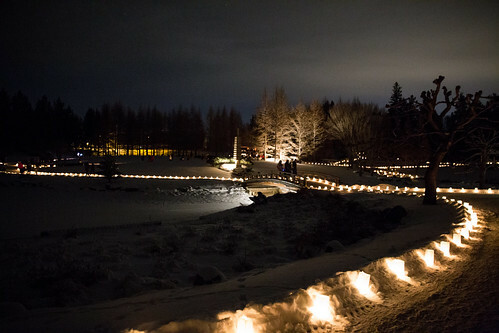 Our first time at Luminaria did not disappoint, and we really did appreciate how easy it was to get to and from the Devonian Botanical Garden. If you’re interested in checking it out for yourself, mark your calendars for December 2-4, 2016. Tickets go on sale September 1, 2016.